As part of the Lakeside Center campus, Davis and Robison Lodges provide housing for up to 14 people total, with an additional apartment used for the Residential Director. 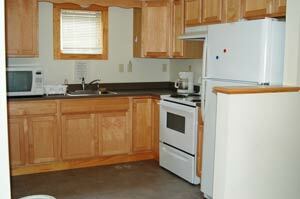 Each lodge has a full kitchen with refrigerator, stove, microwave and coffee maker. 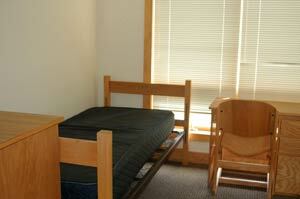 The rooms are dorm style but spacious, with desks, wardrobes, dressers and single beds. Each lodge has a living room area and deck. Robison Lodge has coin laundry available. Click here for a full list of amenities. 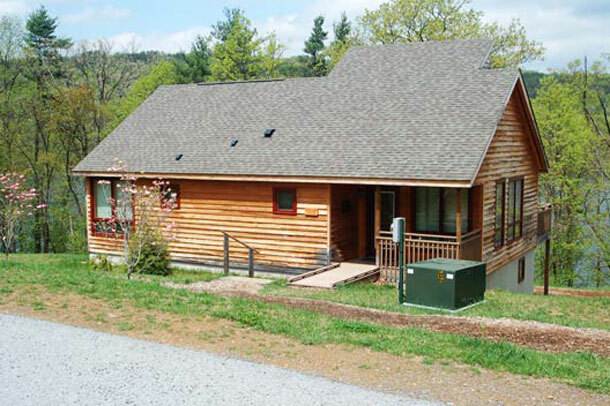 Both lodges have two single rooms and one double room on the top floor. Robison Lodge has two double rooms on the lower floor (total of 8 beds), while Davis Lodge has one double room and an apartment for the residential director (6 beds plus the apartment). 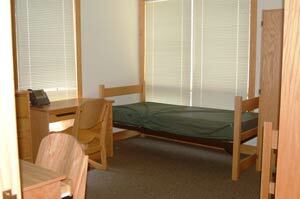 The number of overnight occupants may not exceed the number of beds. 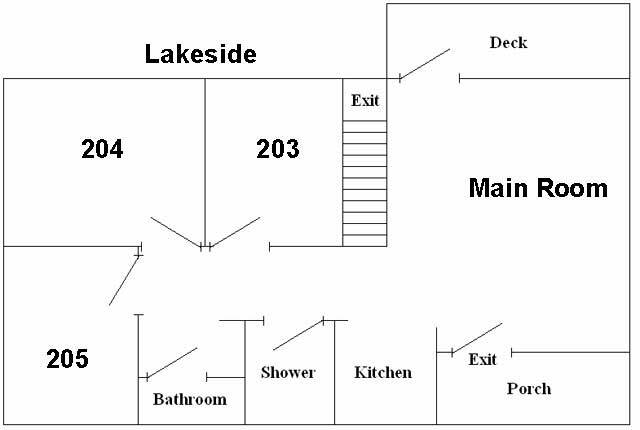 Please see the pictures and floor plans below to get a better sense of the buildings. You can find out more about renting these facilities, or students can follow these links to learn more about residential life at the station and our residential semesters. 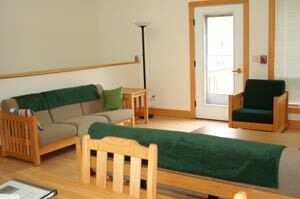 Each lodge has a common area with a couch and two padded chairs as well as a dining table with four chairs. Each lodge has a kitchen with a refrigerator, stove and other basic appliances. 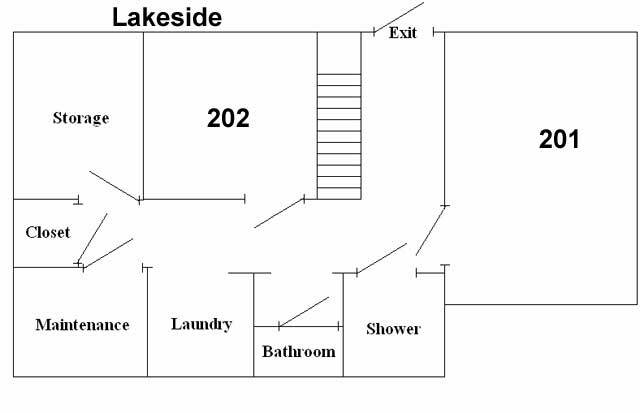 Davis Lodge Lower Level Floor Plan: Room 102 is the Residential Director's apartment. Room 101 is a double (two single beds). 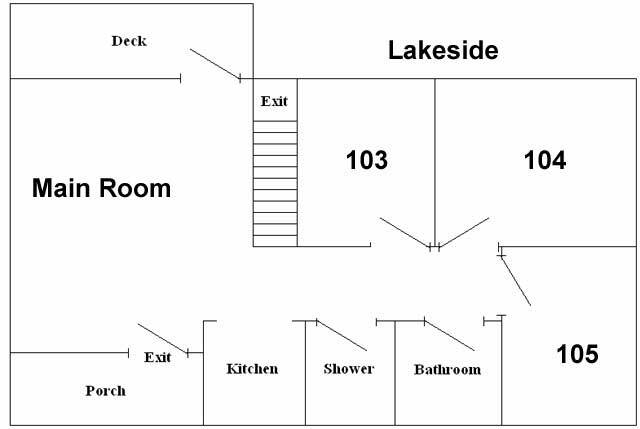 Robison Lodge Lower Level Floor Plan: Both rooms on this floor are double rooms (two single beds each).